Yachting Boating World: The new luxury motor yacht by Prestige will be on show at the illustrious event in January, Ancasta International Boat Sales have announced. The Prestige 680 was launched at Cannes last September and will make its UK debut at the London Boat Show 08 – 17 January 2016. Designed by Garroni Design and with a J&J hull, the 68-foot Prestige 680 is powered by Twin Volvo IPS 1200 engines and has a top speed of 30 knots and a cruising speed of 25 knots. This stunning motor yacht has all the features that have made the Prestige brand so successful and has elements of the brand’s flagship Prestige 750. Its flybridge has a very large private space that links to the lounge area with a galley bar and a large, forward sun terrace. The helm position allows for maximum visibility to all areas of the boat. The interior is all clean lines, light and lots of storage space, and the aft galley has the same layout of the other Prestige models, with plenty of room to cook and entertain. The owner’s cabin is raised and forward, giving privacy and light thanks to its large windows, whilst the guest cabins are on a separate level and are accessed by their own staircase. 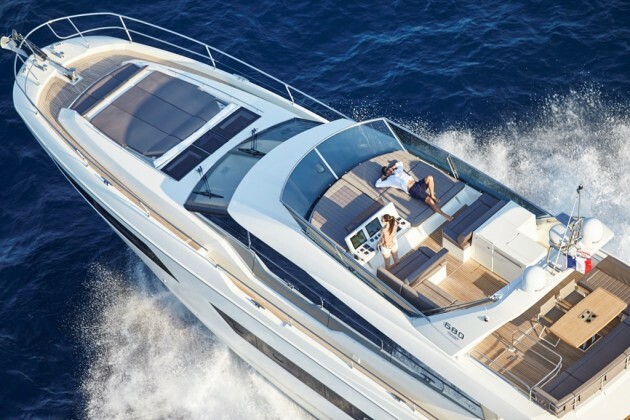 The model is available with a three- or four-cabin layout plus a cabin for crew and is priced at £1.51m, excluding VAT.